Here’s a real MacGyver office hack for you. Ever find yourself without a paper clip or stapler handy, but need to quickly and firmly keep a bunch of papers together? 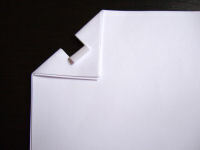 This step-by-step tutorial will show you how to use an origami technique to keep all your papers fastened. Of course, this technique does require the use of a scissors… and if you don’t have a stapler or paper clips handy, then you probably don’t have your scissors in reach either.